Besides the obvious coconut oil, apple cider vinegar, and brown rice, there are a few staples that I always try to keep on hand at home. They're all quite versatile and can be used in a great number of different recipes. Trader Joe's recently stocked a jar of fair trade Himalayan raw honey for an outrageously affordable price and, let me tell you, as soon as I saw it I (gently) tossed one in my cart and was tempted to hoard the entire shelf. Raw honey has so many uses! You can obviously use it for anything that calls for standard honey but you can also use it to make a face mask, soothe a sore throat, and mix it into a glass of warm almond milk as a sleep aid. My jar of bee pollen often elicits questions and strange looks but, believe me, it's a superfood. Bee pollen is anti-inflammatory, an antioxidant, and is rich in protein, amino acids, B-complex, and folic acid. It can also work as an anti-histamine and help ease allergy symptoms! I use pollen from Y.S. 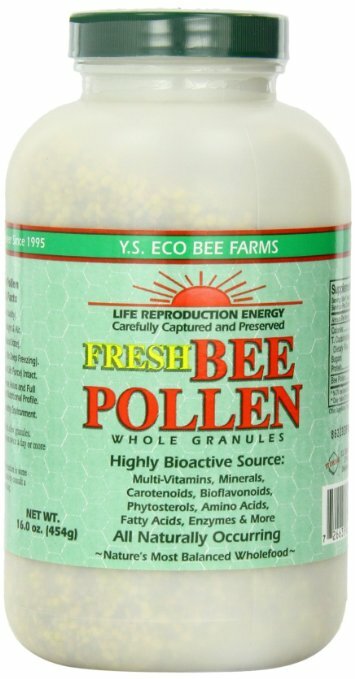 Organic Bee Farms (available on Amazon or Whole Foods) and sprinkle a bit of pollen into my smoothies, yogurt bowls, or take a teaspoon by itself. The benefits of protein powder are clear, but I like to keep amped up versions (like Moon Juice's Blue Adaptogen Protein) in my pantry. You can, of course, blend the powders into smoothies and shakes, but I also recommend incorporating it into your cooking. Try out some protein pancakes, truffles, or vegan nice-cream. This may seem a little basic, but I'm still asked about it from time-to-time. Pink salt is superior to table salt in so many ways! While table salt is highly processed, good quality pink salt is often relatively unprocessed and sometimes even harvested by hand. Unlike table salt, pink salt is unbleached and doesn't contain a ton of nasty additives. Accordng to Dr. Axe, the salt is antibacterial and anti-inflammatory, can help balance your body's pH, naturally aids in digestion, purifies the air (hence the fact that I have salt lamps both at home and at work), and can even induce sleep. Plus, it has a much better flavor than table salt! To put it frankly, chickpeas are my addiction. I eat them constantly. Sometimes, my dinner will consist entirely of a can of chickpeas because they are that addicting. You can use them for hummus, dips, and atop salads but my favorite thing is to simply rinse, add salt, pepper, and paprika then roast at 400 degrees for 20-25 minutes. Like chickpeas, chia seeds have been a favorite of mine for years. It's one of the most versatile foods that I can think of and super easy to work with. They contain protein, fiber, fat, calcium, manganese, magnesium, and phosphorus as well as some zinc, potassium, and other vitamins. I add a tablespoon to my smoothies, sprinkle on top of just about everything, and add them to overnight oats. However, one of my all-time favorite treats is chia pudding. Simply add 3/4 cup of liquid to 3 tbsp chia seeds (plus add-ins like vanilla extract, fruit, etc.) and let it sit in the fridge overnight to create a super easy, cold pudding. If you like making your own dressings, tahini is a must. It's a thick paste made from toasted sesame seeds and it's incredibly flavorful, with a rich, nutty taste. You can use it in salad dressings, to top your Buddha bowl, to make protein truffles, or even in a handful of desserts. Tahini is rich in minerals, high in unsaturated fat, and is very easily digestible. I always have a giant bag of rolled oats in my pantry, mostly for breakfast but also for smoothies and treats. Oats are good source of fiber and carbs and are also loaded with nutrients. Oats are also super filling, which helps prevent snacking, overeating, and feeling hungry before lunch. My go-to breakfast during the week is overnight oats or Bircher muesli, which are essentially made the same way. Fill a jar with rolled oats and almond milk, then stir in any flavorings (maple syrup, cinnamon, cardamom, lemon juice, Greek yogurt) then refrigerate overnight. In the morning, top with fruits and nuts. This is another one of my favorite go-to's that my family has been using for years! Nutritional yeast has a vaguely cheesy flavor and can be added to spaghetti or melted down with Earth Balance to make a broccoli sauce, among many other uses. It's a great source of complete protein and vitamins such as folates, thiamines, riboflavin, niacin, and other B-complex vitamins which means that it's a perfect supplement for vegetarians and vegans. Liquid amino acids are essentially a healthier version of soy sauce. The taste is almost identical, but Bragg's is gluten-free and has no added table salt. I like to have a bag of dried fruit---right now it's cranberries---available for a variety of uses. I'll add some to my salad, mix a scoop into my muesli, or just snack on them straight from the bag throughout the day. Almond butter has a lot of hype these days and it's great, but I'm personally more of a peanut butter fan. I like Earth Balance's creamy variety or the freshly ground PB from the machines at Whole Foods. I use nut butter for so many things. Smoothies, sandwiches, banana toast, cookies, sauces, and so much more.